Canada is one beautiful, expansive country. So big, in fact, that when you say “I’m going to race Ironman Canada,” it might be like telling someone you are going swimming in the Pacific Ocean. Oh cool! But what part…. So for those who are considering signing up for Ironman Canada Whistler, I’d like to share with you a little travel secret. Staying in Whistler Village (or VERY near to it) is an absolute necessity the day before the race, as they shut down a fair amount of the roads leading to here the morning of. But if you’d like the full “Trilife Fitness” experience, make your way to Vancouver beforehand and explore this bustling, yet refreshingly quiet city. The Westin Grand is located directly in the middle of this bustle. It is central to pretty much anything you could desire (even the Seawall, something I will discuss shortly). I was blown away by the helpfulness of the staff. I had an enormous bike case to lug up many flights, and they actually offered to let me use their side freight elevator so I didn’t have to wait for the main elevators to be magically empty. The hotel had valet or self park options available (and because you are IN THE BUSTLE, you will want to use this feature). My suite was above and beyond enough space for just little (giant) ol’ me. If you are traveling with a spouse, loved one, or a couple of friends, these rooms have a separate area with a bed (and a door that shuts), as well as a living room with a pull out couch. The views were breathtaking. Vancouver is a very unique looking city, and I spent many moments sitting beside the floor-to-ceiling windows, staring out into the urban landscape. I found everything about this hotel convenient and “easy” (in a good way). Easy to speak to people, easy to get around, easy to feel relaxed, etc. I was REALLY sad that I didn’t get a chance to splash around in their outdoor high-floor pool (I was with some friends and we had lots of things to do). I loved that they served drinks and had music playing for happy hour at the pools edge. So fun! The hotel offered to put me in touch with Tourism Vancouver, and they handed me the golden ticket to the city. Aka the destination experience pass. Naturally I chose to spend my time biking around the city (using my pass to gain access to a really cool local bike rental shop called Cycle City Tours. They sent us off with bikes, helmets, and some easy-to-follow (there is that word again!) directions on how to get to the Seawall. The Seawall is a 28km pathway that wraps around the water’s edge of city features such as Stanley Park and the Vancouver Convention Centre. I am not sure if I have ever enjoyed a city bike ride quite so much! I loved that the path is one-way. Meaning once you are on it, you have to commit. A path that speaks to my own heart. 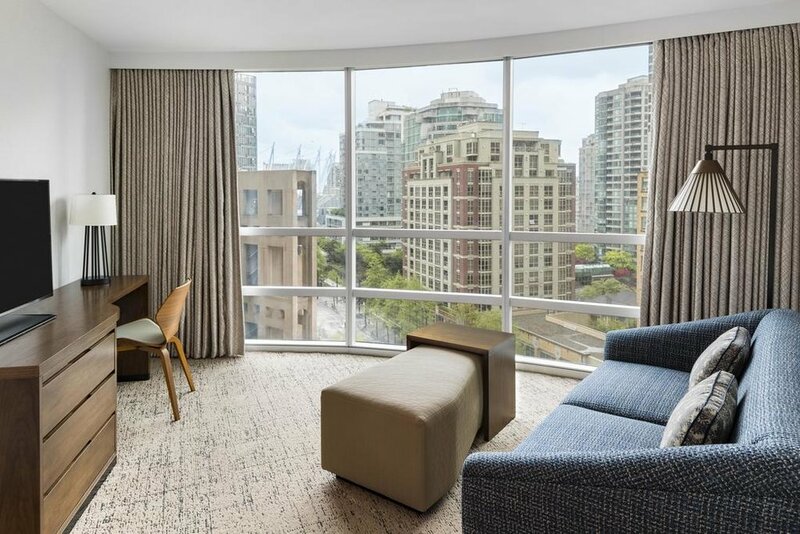 If you are traveling to Canada for a race, a work trip, or a vacation, I highly suggest checking out the Westin Grand in Vancouver. I didn’t mention the drive time between Vancouver and Whistler, but it could be 14 hours for all I care. Taking Hwy 99 there (the sea to sky highway, part of the Ironman Canada course in fact!) is hands down the COOLEST drive I have ever done. Towering, snowcapped mountains, glassy lakes, SEA PLANES, greenery everywhere. Also, it isn’t a 14 hour drive, just a very reasonable hour and a half. Let me know if you end up visiting or need additional recommendations! Happy Tri-ing.